It's that time of year again. The sky is gray. It's cold and crisp. It looks like snow, and it even smells like snow. It's going to snow. It's the time of year when many of our Porsches go into hibernation. Many of you reading this may be heading into your first winter with a Porsche as a daily driver. Still others may be curious as to how their car would hold up against Mother Nature, and if it is even something that can, or perhaps should, be done. I have had the pleasure of owning and driving some four dozen Porsches. These include seven different varieties, and I have had the opportunity to drive another 10 or so other models that I can remember. I have also had the luxury that none was ever my daily driver. I presently own more 944 and 951 cars than I can count on my two hands. Three are registered and insured and driven on occasion, others are in various phases of restoration. There is a race car in the mix, and a few are just in storage. Still, none is my daily driver. That duty is reserved for a pickup truck and has been for quite some time. Being a pickup truck guy, the thought of driving my Porsche cars in winter weather had never even occurred to me until a few years ago when the topic surfaced in an online forum. I found the concept fascinating for two reasons, both of which now seem obvious. First, I finally recognized that many, many people rely on their Porsche as their primary or only vehicle. When it gets cold, they simply change their habits and go about their business. The second reason seemed so logical that it bothered me that I hadn't considered it sooner: Why wouldn't you want to drive a car with a reputation for exceptional handling, superb balance and a forgiving disposition if the elements were more challenging than normal? Although I've owned and driven Porsches for 15 winters, I never had to drive one when the weather wasn't perfect. That applied to each one including an outlaw 356 Speedster, 911SCs, Carrera coupes and cabriolets, Boxsters and finally 944s and 951s. I have a stable full of 944s. None are concours or show cars, and all are natural born race cars with 50/50 weight distribution, predictable and forgiving steering and plenty of stopping power. I really couldn't come up with any reasons to not give it a try. What's the worst thing that could happen? 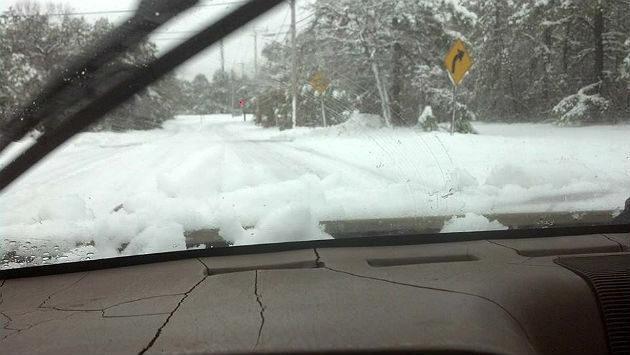 I get stuck, or heaven forbid, have an accident — that can happen regardless what you drive. So, I guess it was just a matter of getting a car ready and waiting for snow. Picking out the car was easy. One of my guys had been working on an off-road car. It was pretty tightly tuned, had a fresh battery, plugs and wires and 10W-30 winter oil. I took it down the street and bought some honest snow tires. They were small and narrow with an aggressive tread and had studs in the rear. Other than making sure the defroster worked and that the wiper blades were fresh, I was ready. I didn't have to wait too long. We had an unusually snowy winter, and it was cold for a long time which kept the snow and ice around. I put on some boots, gloves and a hat and went outside to brush and shovel the two feet of snow from around the 944. I started her up like normal, put on the heat and both defrosters and went back inside while the car warmed up. I let it sit and idle for about 15 minutes and figured it was as warm as it would get. I slowly turned around in my driveway and inched the car up toward the street. I was surprised at how the tires bit into the snow. I got out onto the street, which had been plowed and salted but was pretty messy. I was happy that I was the only car on the road while I was trying out my snowshoes for the first time. I put the 944 into second gear, let out the clutch and I was off. Before I ventured far from home, I wanted to prepare for the worst, so I got up a little speed and hammered the brakes. They locked and the car slid, but I was immediately able to reel it back in through pulsing of the brake pedal and steering as I would with any other slide. I went a little faster and was able to use the transmission with the brakes and not even slide at all. The car was OK, and so was I. Let's go driving. It had snowed more than 20 inches the prior evening, and there was not much activity at 8:30 in the morning. The major roads between my home and my shop were plowed and had about an inch of snow and sand cover. There were no other cars out. 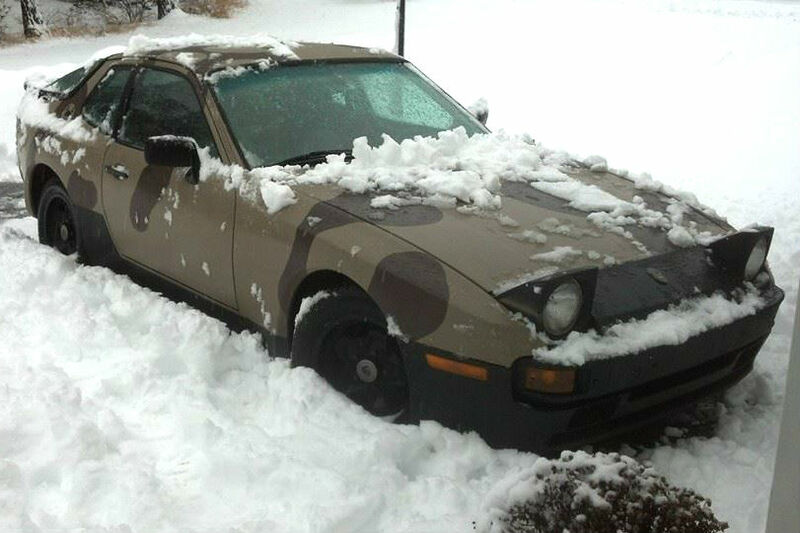 There were a few trucks with big tires and a bunch of plows, and me in a camouflaged Porsche with snow tires. Not only did the car do as well as I could have hoped, it was actually really fun to drive in those conditions. I have compiled a little list of preparations I will be making to my winter Porsche this year and hope that it helps out those of you who will be driving your car all year long or those who just want to try their hand in the white stuff. Please note that road treatments like sand and salt are wicked on paint and should be washed off as soon as possible. Also, if the conditions are really dangerous, please consider your safety and that of other drivers before driving any vehicle in the snow. However, if the stars line up and you have the opportunity, the snow can provide you yet another reason to really appreciate the design of your Porsche. 1. Brakes: They should be fresh, with lots of life left in the pads and rotors. Your fluid should be clean and clear and properly bled. This is true for all seasons, but especially when you already know that stopping can represent a challenge. 2. Tires: I used Mastercraft Glacier Grip tires with studs in the rear and without studs in the front. They were exceptional. In addition to my snowshoeing, the car went out onto frozen Chippewa Bay for ice fishing and made six or seven round trips to Buffalo from New Jersey through actual blizzards. Different states have different laws about whether you can have studs, and then when you can have them. If you plan to drive in snow and your local laws permit it, I cannot put enough emphasis on the difference they made. In any event, an honest snow tire should be high on the list of prep items. 3. Battery: This is the next maintenance item that you should consider. I learned that batteries have an interesting little habit of losing half of their power when the temps slip below zero. Find a group size that works and get something with a lot of cranking amps and a good cold-weather rating. All the other items won't matter if the car won't start. 4. Antifreeze: This is an important item for those of you with water-cooled Porsche vehicles. I have a shop, so a seasonal flush and fill is standard depending on the service history of our vehicles. But for my winter ride, I stepped up to a high-strength, phosphate-free variety. I bought it undiluted and mixed at a ratio that gave protection until minus-40 F. It never got that cold, but I felt really good about it and the car seemed to run just fine. When the spring came, I drained the radiator and refilled it with the same brand at a higher dilution and the car ran cool all spring, summer and through the fall. 5. Heat/defrost: These are other items that I checked. The typical complaints I have when working on vintage Porsches at our shop is that the car is too hot, so getting the heat to blow isn't a common problem, but making sure the controls are in good working order and that the defroster, in particular, clears the cold stuff off the windscreen is important to address before venturing out in weather where rolling down the window might not be an option. 6. Wipers: I am 43 years old and only learned last year that there are winter wiper blades. They have a rubber boot on the mechanism that keeps snow and ice from forming inside of the arms. Pretty ingenious and pretty inexpensive. Go for it. 7. Headlights: Make sure all your bulbs are in good working order. Fog lights or auxiliary driving lights both are valuable. In reduced visibility, your lights will help you see a little farther, and possibly help you to be seen by someone else. This is another item that you should be on top of, regardless of the season, but in winter weather it's especially important. 8. Exhaust: I am speaking about Porsche 944s right now, but this is something that you may not otherwise consider. If you're like me, a lot of the time you spend in your Porsche is open-air time — roof out or open, windows down, targa top off, etc. You may not even know that you have an exhaust leak or, if so, you might have put off addressing it because other than a little noise it never seemed problematic. In the winter, with the heat on and the windows rolled tightly up and your car moving slower, an exhaust leak can be one of the worst problems you can have. Make sure your exhaust gases are exiting the car where they're supposed to. 9. Cellphone and charger: In today's world, you shouldn't leave home without them anyway. In inclement weather, it's that much more important. I can't tell you how you'll be received by the tow truck driver if you actually have to be helped, but the alternative is not good either. 10. Emergency kit: I don't know what to suggest you should bring in yours, but I remove the spare tire from my cars and put in a duffle bag with some tools, green tire-fixer goo, a compressor, some flares, a whistle and a first aid kit. I suppose you could add a blanket and some hand warmers but I probably wouldn't be driving my Porsche, regardless of how much fun it would potentially be, if I actually thought I might need a winter survival kit. About this time every year, I start hoping that it won't snow. I cross my fingers, think about the spring and hope we get a mild winter. This year, might be just a little bit different. I'm still not a fan of cold, dark and treacherous, but I must say I hope I get the opportunity to get to try out a little bit of snow driving before the days get long and the grass is begging to be cut again.